Actualize this: If you’re going to be all you can be in 2016, you need more than food, shelter, love and esteem. It’s Friday evening of “earnings week.” Our 1Q16 earnings press release and call were on Wednesday, followed by two days of back-to-back calls to explain the details and nuances of our results with investors and analysts. So now, with the phones quiet and the office empty, it’s time for a single malt. And while recapping the week, I find myself reflecting on the psychology of life in the cyberlane. I’m as far removed from a psychologist as Bernie Sanders is from Donald Trump. But looking back on the time when I was force-fed the various theories of psycho-babble of the day, the one that still sticks in my mind is Abraham Maslow and his renowned hierarchy of needs. You may recall that Maslow’s theory is typically portrayed in a pyramid with the most basic needs at the bottom. To remind those of you that slept through that part of the class, and not without good reason, Maslow observed that certain fundamentals needed to be fulfilled, like food, oxygen, water, before you could focus on, and appreciate, the finer things in life (e.g., art and music) and eventually “self-actualization.”Self-actualization is of course at the apex of the pyramid. Now, Maslow published his theory in 1943 in the book, “Motivation and Personality,” which I’m sure was just flying off the shelves back in the day. I guess after coming up with the pyramid, the marketing team was too exhausted to come up with a snappier title. But back in 1943, we didn’t have the Internet. Or even the MacBook. Back then, an Android was still a robot with a human face getting bit parts in cheesy science fiction movies. The point is, the life that Abraham Maslow was thinking about actualizing was radically different than the life of a Millennial today. So, in defense of my favorite psychologist, and as a service to the faithful readers of the iPass blog, I offer this updated guide to self-actualization in the Age of Mark Zuckerberg and Sergei Brin. With this scholarly research as context and background, let’s probe more deeply into the psychology of today’s mobile workers, and the net natives they’ve spawned. Well, maybe not that deeply. I did mention it’s Friday night. To get to the point, whatever you need to self-actualize, at work, at home, on the road, or in the air, we need to be connected. 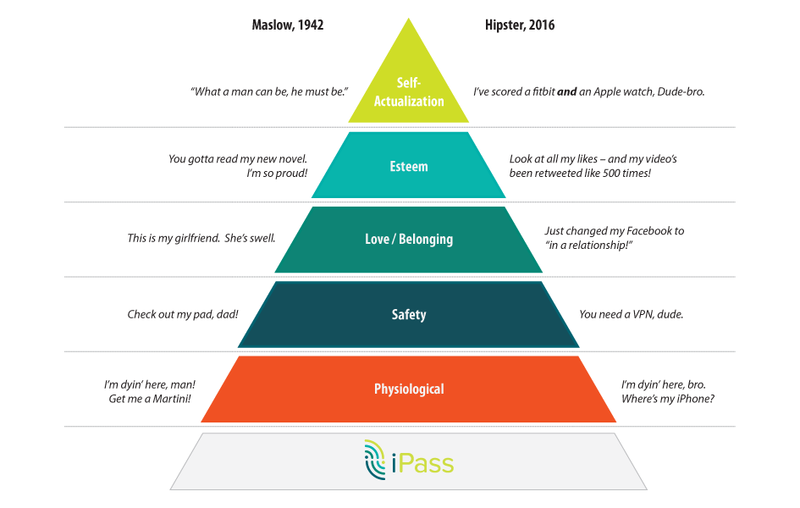 And that’s where we come in: it’s 2016, and we’ve added a new base on Abe’s Pyramid: iPass. Because what is a more compelling need than Google and Facebook and YouTube and Snapchat and Twitter? It’s being connected, everywhere. All the time. So you can relax. Don’t fret about food and water or bits and bytes. We’ve got you covered. With iPass, you can self-actualize all you want, while leaving the basics to us.